Indigo 7 provides several tools to manage your Z-Wave network. Not only can you create/control/delete devices but you can also manage device associations and scenes. See the Connecting Z-Wave Interfaces section of the Getting Started Guide for details on connecting and configuring your Z-Wave interface. Tip: if you're having issues with Indigo communicating with some of your Z-Wave devices, look at the position of your Z-Stick or EZController / Z-Troller. If you have it plugged directly into your Mac then the chances are that the signal range is reduced somewhat. Also, if there are any other electronics close to it (external hard drives, etc.) then you may want to try to move the interface around a little. For the Z-Stick, try a USB hub with connectors on the top that allow you to position it vertically. A word of warning: some users have used short USB extension cables successfully but others have found that these sometimes cause communication errors with the Z-Stick. Indigo supports a variety of Z-Wave devices. Before proceeding, make sure that you have connected and enabled your Z-Wave interface. Select Z-Wave from the Type popup menu. Click the Define and Sync… button. You'll see the Synchronize Z-Wave Device dialog. Follow the directions on the dialog to complete setting up the device. Note: all battery-powered Z-Wave devices will go to sleep to conserve battery power - when they are asleep, they will not respond to commands. Indigo needs to send the device some commands when it's adding the device, so you'll need to follow the manufacturer's instructions to wake the device up when you actually add the device to Indigo. As mentioned in the dialog, we recommend using encryption only for devices where it is beneficial or required (like locks). Although encryption increases security, it can also degrade responsiveness of the hardware and increase the potential for network congestion and retries. The additional commands required for encryption can also decrease battery life. If you added a device to the network (Z-Wave Controller) without encryption enabled and then wish to enable encryption you must first remove it from the network. This is because the encryption key exchange can only occur with Indigo if the device has just been added to the network (within a few seconds), and before a device can be added to the network it must not be included in any networks. To do this you can use the Interfaces->Z-Wave->Start Controller Exclusion Mode menu item to put the Z-Wave Controller into exclusion mode, then follow the steps from the device's manual to have it exclude itself from the network. Once excluded (you can see the progress in the Event Log window), you can then use the New with Encryption Enabled button inside the Syncrhonize Z-Wave Device dialog to re-add it to the network with encryption. If you have a Z-Wave lock currently included with another controller, you must first exclude the lock from the network before adding it to Indigo with encryption enabled. 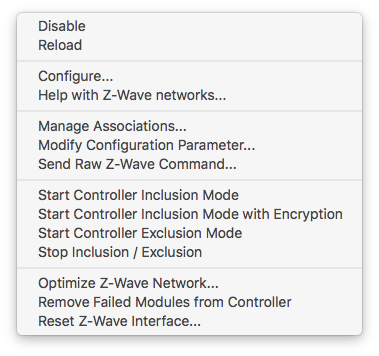 To do this you can use the Interfaces->Z-Wave->Start Controller Exclusion Mode menu item to put the Z-Wave Controller into exclusion mode, then follow the steps from the device's manual to have it exclude itself from the network. Note you do not have to use the original controller to perform the exclusion – you can use Indigo's exclusion process. Once excluded (you can see the progress in the Event Log window), you can then use the New with Encryption Enabled button inside the Syncrhonize Z-Wave Device dialog to add it to Indigo's Z-Wave network with encryption. Follow the instructions from the lock's manual for the inclusion steps required. Note that either the Z-Wave Controller used by your Mac or a device that supports Z-Wave beaming will need to be within close proximity to the lock for the communication to succeed. Once you've defined your device, you can edit its properties. If you've still got the device dialog open, you can skip the first three steps below. The top part of that dialog shows some details about the device that will help support when diagnosing problems. Next, the polling properties for the device are shown if they are applicable to the device type. The first thing you need to determine is if the device needs to be polled to check for status changes. Most devices will require some kind of polling to stay in sync. There are a few devices that Indigo can determine status changes on automatically, and we'll turn off the checkbox for those when we define the device. There are many devices that don't send out this information though (primarily because of some patents held by Lutron) so we give the option to poll the device. Next, select the desired polling interval. This setting is quite important actually - the more frequently you poll a device the more congested your network will become. In fact, we can't guarantee an exact polling frequency below 5 minutes because we have to watch for the network to become idle before we can try polling. So, we suggest that the less important devices to keep in sync are polled at longer intervals and more critical devices get polled immediately. You can also poll devices that can't or don't get manually operated at a much lower frequency because Indigo will update the state as soon as the command to operate the device is acknowledged. The top item on the list, Only When Activity Detected, is a great optimization - some devices send out a message whenever they change - they don't actually send the necessary information for Indigo to automatically update state, but it is enough to bump the device to the top of the poll list so that the status update will occur much more quickly. And it keeps us from having to poll the device at regular intervals because we can just poll it when we see this specific message. How do you know to select this option? You can try the setting out: just select Only When Activity Detected and save the device. Then, go manually operate the device. If the status updates (within about 10 seconds) then you can leave it. If the status never updates then you'll need to pick one of the other intervals as described above. The fastest polling option is As Often as Possible - we'll poll the device as frequently as we can given the conditions of the z-wave network. Also shown in the settings dialog are any configuration parameters specific to that device (in this example the temperature units and display contrast). Indigo only shows settings if there is a custom device profile for a particular device. However, if no settings are shown you can still modify any configuration parameters by using the Interfaces->Z-Wave->Modify Configuration Parameter... menu item. If a Submit Device Information button is visible, then you can use it to help us learn more about the device. When pressed a page will open in your browser asking for some more information that will help us and other users more effectively use the device. Please take time to accurately fill out the form as much as possible. The more information we have the more likely we will be able to add a custom device profile to fully support the device. Maintaining our Z-Wave Supported Device List is a community effort since we can't possibly directly test every Z-Wave device available worldwide. We appreciate your help! Find the device in the device table and double click it (or select it and click the Edit… button). When the Synchronize Z-Wave Device dialog disappears, just close the Edit Device dialog. This will tell Indigo to query the device and update various information about it and may help with some communication issues. Follow the instructions on the dialog to use your interface to include the device into your network if you haven't already. Note that not all devices can be replaced. Specifically, if a device has multiple personalities (like, for instance, a multi-sensor that has a motion sensor, temp sensor, humidity sensor, etc) and any of those dependent devices are used in Triggers, Conditions, Actions, or Control Pages, then you'll get an error message in the Event Log window saying that you need to manually resolve those conflicts (or manually delete the device). Indigo helps with this process - see Deletion Dependencies for details. Find the device in the device table and select it. Click the Delete… button (or press the Delete key on the keyboard). If the device has any deletion dependencies, Indigo will show the dependency dialog that will allow you to review and/or modify any of those dependencies. If you choose to continue the deletion process, the device will be deleted along with the dependencies. The last thing you'll want to do is to exclude the device from your network if it's still functional. To do this you can use the Interfaces->Z-Wave->Start Controller Exclusion Mode menu item to put the Z-Wave Controller into exclusion mode, then follow the steps from the device's manual to have it exclude itself from the network. You may need to replace your controller. This section describes the steps involved in moving your Z-Wave devices to a new controller. Remove your old controller from your Mac. Plug your new controller into your Mac and reconfigure the Indigo Z-Wave Interface to use the new serial port. Select the Interfaces→Start Controller Exclusion Mode. Note you can exclude from any controller, not just the one it was included with. Go to the Z-Wave device closest to your Mac that’s not battery powered (also skip any that require encryption) and perform its exclusion process. Go back to your Mac, edit the device you just excluded, click the Define and Sync button and press the New with Encryption Disabled (only select Enabled if you're including a device which requires encryption to work correctly, such as a lock). Go back to your device and perform its inclusion process (press its LINK button, etc.). Return to your Mac (it should say Inclusion into network successful in green just under the Add to network buttons), confirm that the new node shows up in the popup at the bottom, and then press Sync. Repeat steps 3-7 for each non-battery powered device from the closest to your Mac to the furthest. Repeat steps 3-7 for each battery powered device or devices that require encryption. Finally, select the Interfaces→Z-Wave→Optimize Z-Wave Network… menu item and click Start Optimization - you can do this at night just before going to bed when the network is likely to be the least busy. Remove your old Z-Stick from your Mac. Plug your new Z-Stick into your Mac and reconfigure the Indigo Z-Wave Interface to use the new serial port. Unplug your new Z-Stick from the Mac and take it to the Z-Wave device closest to your Mac that’s not battery powered (also skip any that require encryption) and exclude it. Note you can exclude from any controller, not just the one it was included with. While at the device, include it into the new Z-Stick. Plug the new Z-Stick back in to your Mac. Open the config dialog for the device you included and click the Define and Sync button. Select the new node number from the popup at the bottom and Sync. The Interfaces→Z-Wave submenu contains several Z-Wave specific menu items to help manage your Z-Wave network and devices. Below are the current options. Indigo supports defining Z-Wave Associations (which are similar to INSTEON links) between devices that support that functionality. Note that battery operated devices which are asleep will need to be woken up (per their instructions manual) for associations to be edited. Some Z-Wave devices provide configuration options through the use of configuration parameters. These are generally outlined in the documentation that comes with a device. Indigo often times support setting these parameters directly in the device config dialog, but because of the sheer number of Z-Wave devices we can't add every one. This menu item will allow you to set any config parameter that a device accepts. Note - this process can cause your device to not function correctly if incorrect parameters are entered so you'll want to make sure you are very careful to use only the params specified for the specific device. This menu selection can be used to send arbitrary Z-Wave protocol-level commands to any Z-Wave device. This is generally only useful when Support instructs you to do so. Note battery operated devices allow for the option to queue the command to be sent the next time the device wakes. This menu selection puts the Z-Wave Controller into inclusion mode. You can then follow the steps from the device's manual to have it include itself from the network. Open and watch the Event Log window for progress as it is included. This menu item is functionality the same as using the New with Encryption Disabled button inside the Synchronize Z-Wave Device dialog. This menu selection puts the Z-Wave Controller into inclusion mode with encryption enabled. You can then follow the steps from the device's manual to have it include itself from the network. Open and watch the Event Log window for progress as it is included. This menu item is functionality the same as using the New with Encryption Enabled button inside the Synchronize Z-Wave Device dialog. This menu selection puts the Z-Wave Controller into exclusion mode. You can then follow the steps from the device's manual to have it exclude itself from the network. Open and watch the Event Log window for progress as it is excluded. Note Indigo is able to exclude device s from any Z-Wave network. This menu selection exits both inclusion and exclusion mode. Indigo can optimize your Z-Wave network by having devices rediscover which devices they are close enough to communicate with. This information is then reported back to the Z-Wave Controller so network routing tables can be updated. If a Z-Wave device is no longer available to your network (it failed, etc) then you can use this menu item to remove it from the interface. You might need to attempt a Define and Sync on the device (and allow it to fail) just before using this menu item. You can completely reset your Z-Wave interface by selecting this menu item. You should only do this if instructed by Support.